The problems were suggested by users roosephu and sunayuki. The great help in preparing was provided by Aksenov239, GlebsHP and Codeforces team. ZeptoLab Team did its best while working on statements. The round will use smoother dynamic problem scores with 250 points steps. 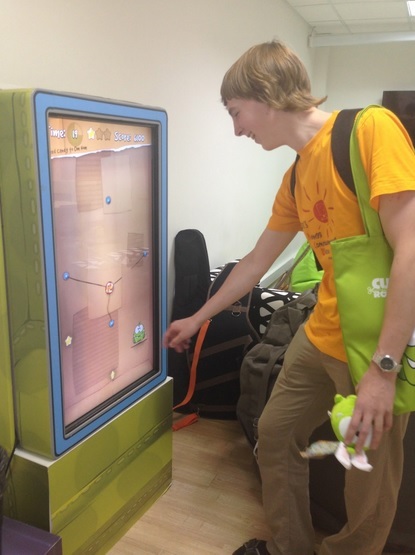 In 2014 we hosted our first programming contest together with Codeforces, and we liked it! Let me shortly remind you how it was. The contest consisted of 6 problems, 2.5 hours were given to solve (you can have a look at the problems of the previous year and try to solve them here). 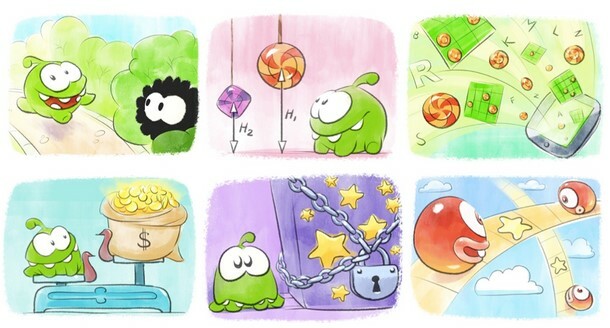 Zepto Code Rush 2014 broke the existing Codeforces record of round popularity. Also we were glad to read a positive feedback about problems. By the way, the first three places were taken by developers from Russia. Some of them even came to pick up the prizes at the office, where they had a mini-tour and the highlight of the program: of course, the game in a giant Cut The Rope and our standard corporate "going green" welcome kit at the entrance (we call "going green" a welcome kit, full of fun gizmos of our corporate green color). I first came for the candies (just kidding), but if I share experiences now — what's especially important is that I can be myself here to the end. Zeptolabians are tolerant of my oddities and appreciate me as a person. In addition, Zeptolab leaders set goals, taking into account the abilities of each developer, including me. And when the head is also "into" algorithms, I can realease my potential. In the end I became a sort of client-side back-end developer, which, in fact, I wanted in the first place. Yes, I know some of the data structures that are unlikely to come in handy in Zeptolab soon (they would be more useful, for example, in developing a search engine); I almost never use this part of my knowledge in my daily routine. But these skills are useful to me on the internal algorithmic contests :) What I can say about Working moments: my last task was to improve packaging of atlases in preparing of game resources – a well-known NP-hard problem. I managed to make significant progress: to improve the famous algorithms, the best in 2013 in a variety of metrics. As a result, the memory consumption in all our game projects decreased by megabytes. With the appetite of our artists, I think it's not for long :) Maybe we'll publish my work in one of the next conferences. Overall, sports programming skills are highly valued here, and this, in my experience, is what isn't appreciated enough in other companies. And this post is made to inform you, dear algorithm lovers, that: Zepto Code Rush 2015 starts on Saturday, April, 4, 16:30 (UTC). We are working on problems for the contest and ready, but we are ready to announce cool prizes! You cannot get a vest like that in other ways besides taking part in the contest. The vests are great! And as usual, the person who shows good results in the competition, will be able to get a job in our company by a simplified scheme. You can read about ZeptoLab on our official website. Want to apply to ZeptoLab? ZeptoLab Code Rush 2015 will use standard Codeforces rules, it will be a rated round for the both divisions. This contest will be rated ?? or get any editorial ?? it will be a rated round for the both divisions. Rare! This is one of a few clothes you can win from a programming contest, and you can actually wear it in some not-programmatical place. Oh, c'mon, wasn't it a sarcasm? It doesn't look like one, especially geniucos' comment. I would kill to get that cute toy and vest! I love ZeptoLab. The code rush will be good! i really wonder if viktork is fake account or a specialist host the zeptolab code rush! Well green matches well with the vests..
tourist would you leave the IPHONE 6 this time ? No chance,tourist would participate and would win again. Still waiting for last year's Tshirt..
your company's games are full of fun,and they are popular in my country! How can we register guys? 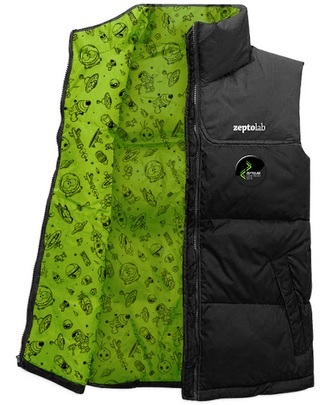 Obviously the vest is great and I want it. If you want to highlight both the upvote(green) and downvote(red) arrows simultaneously you should first click on the upvote arrow and then "very quickly" after clicking on the upvote arrow , click on the downvote arrow . As long as you don't reload the page. ( I'm disappointed ). Hopefully there would not be many unknown giant-non-rated(div1 coder competing in div2) coders here!!! Huh this is combined division contest. This only happens in div2 only contests. So no need to worry. -_- Very nice joke Mr. sepehr103. April fool is over though. iPhone 6 is waiting for you ! I moved the round 5 minutes forward just to be sure that everybody are ready and registered. May the Force Om Nom be with you! Welcome kit of Zepto Lab is "going green", but for codeforces, it is "going RED"!! 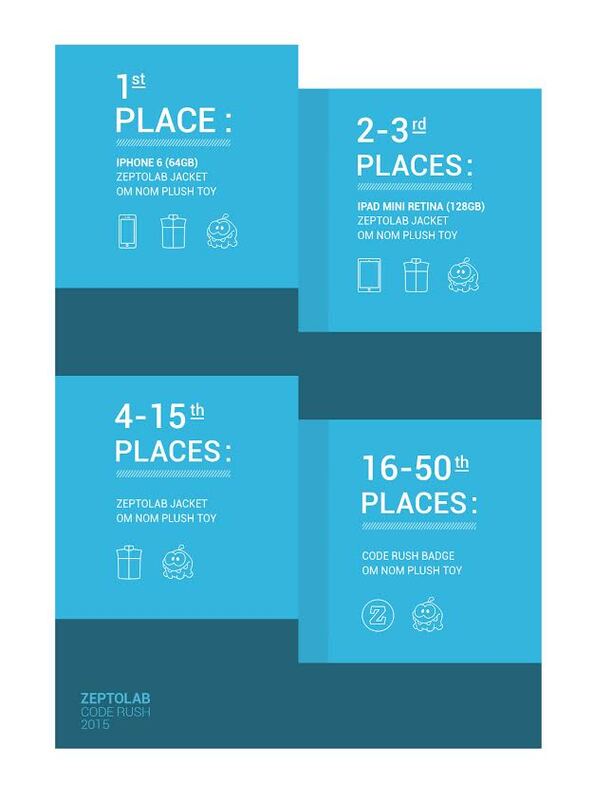 Wow, the prizes are awesome, and I'm sure the problems will be just as good. It's a shame that with >5000 participants a few people (including me) don't stand a chance at getting one of those cool vests. How about giving away a few vests or buttons to random participants besides the top 50, or better yet, a vest for someone random in the top 500, in the top 1000 (places 0-1000), and so on? That way the more skill you have the better the chances for getting a prize, but everyone still has a chance. But then again, prize or no prize, I'm sure we'll have a great time solving the problems :). Can anyone give a hint about E? It is similar to WF2014 Problem K. I used the same method I used to solve that problem, but it may TLE on system test. Use greedy + dfs + binary search to solve it. The O(N * log * Q) is quite obvious with the same method from WF2014 — K, but I think it'll TLE, so I didn't attempt..
My also TLEd (rather understandably). How many groups are necessary to store all the levels from this level to the last level, inclusive. How many more levels, starting from the beginning, would fit in the remaining space in the last group. Now, the answer is the smallest number of groups among levels where the groups include all levels, i.e. minimum of the first number among those i for which the second number is at least i. What's the time complexity of your solution? My solution has time complexity O(nq). If the answer for a query is equal to R, then if you start with the first element and do greedy, your answer will be at most R+1. So lets try to start with the first element and get some answer R', and after that check if R'-1 is also possible. To check that, you can build an oriented tree with edges (P[i], i), where P[i] is largest position such that group [i, P[i]-1] fits. Now you have to find a path in this tree of some fixed length such that the difference between indices of the first and the last vertices of the path is at least N. Since the number of paths in O(N), you can easily check that using dfs. why is it always at most R+1? Because you can divide the group and the answer will increase by one. Mine O(N·Q) approach calculates for every starting position how many groups are needed and what is the sum of leftover elements at the end, which can be eventually grouped with the elements in the beginning. How do you do it in O(N.Q)?? Does problem C have a tricky corner case? Is C a DP? I tried but couldn't think hoe to minimize size of array. How do you solve C? I failed pretty hard on that one :/ Was thinking of some binary search type algo to get logarithmic complexity but didn't work out... Any hints? Splitting it into 2 cases: and . The first case is trivial, you can try all possible numbers of candies of type A eaten and compute the max. number of candies of type B. For the second case, I tried all possibilities for the sum of weights of eaten candies that are worth trying (at least C - Wa); when it's fixed, the optimal solution is taking the max. possible number of candies of one type, which means solving a modular equation. Seems that it's unnecessarily complex, I saw simpler solutions when trying to hack. I just did bruteforce, and it passes. Let's assume that w1 ≥ w2. Kill the cases w2 = 1 and w1 = w2 with "if"s. Then w1 ≥ 3 and now iterate over all possibile x1 — number of type 1 candies. I had used "custom invocation" option and had checked that it passes such tests, before I submited. Is D a DP? How can I solve it? Can you explain your solution, please? Let's ignore K for a moment and focus on choosing A, B. We have that the whole string S must be periodic with period len(A + B). Therefore len(A + B) is a multiple of the smallest possible period P for the whole string. Suppose len(S) = mP + q, with 0 <= q < P. The last q characters have to be in A (as len(A+B) is a multiple of P). Therefore, the necessary condition to write S as A + B + A + B + ... + A is that len(A) = xP + q, len(B) = yP — q, and x+y divides m.
The prefix of length len(S) — L must be periodic with period T = (len(S) — L) / k.
The period T has to bigger than or equal to L (as it is equal to len(A + B)). From the first condition, we want L = len(S) mod k, and from the second condition, we want L as small as possible. So try L = len(S) mod K and check if it's valid, otherwise print 0. KMP indeed! How did you use the pos array? Can you explain the idea behind your code, please? Some hints for problem C ,please!! Why the number of blue candy is smaller than Wr? So if number of blue candy is bigger than Wr, it can't be a best case. (blue candy)*(Wr) can be replaced by (red candy)*(Wb), which has more enjoy unit. Can i filter standings table by color? That's really interesting! I didn't know it, at least I will know for the next time! Is D some kind of KMP? I was trying to figure out something from the mismatch array but failed. How do you track the intermediate Bs? or may be thats not even required? A friend of mine used Z-algorithm. I'm not too familiar with that, so I used rolling hashes for string matching. As long as you have constant-time string matching, it can be solved in O(n lg n): for each value of m = 1...n/k, check if the first km characters is just k copies of the first m characters. If so, also check to see the longest prefix 1...i which matches km+1...km+i (using binary search). Then all strings from km...km+i will be regular (and with some minor details this gives you the output). How to solve C ? Integer Programming seems too complex. We know that X * Wr + Y * Wb <= C.
If we have fixed Y, then X <= (C — Y*Wb) / Wr. As we want to have maximum X, let's say that X = (C — Y * Wb) / Wr. ((C — Y * Wb) / Wr) * Hr + Y * Hb. Now, using binary search we can find when F(Y) starts to be less than F(Y-1), where F(Y) = ((C — Y * Wb) / Wr) * Hr + Y * Hb. I tried binary search and it failed. I tried too but it was implemented wrong and when I found the bug, the contest was over because CF was unavailable. Binary search will obviously fail because the function is not monotonic and even has several extremas. That's why ternary search is also not very good. what's the best time complexity of problem c? I have solved similar problem on http://codeforces.com/contest/519/problem/C but here it's 10^9, and I always tle..... Could anybody give me some hint? Time complexity is O(sqrt(N)), as described in http://codeforces.com/blog/entry/17281. I couldn't hack from Firefox (Chrome worked fine). Hi, could you prove that your solution on C works correct for all cases? If Wr is big, the number of red candies must be small. If Wb is big, the number of blue candies must be small. If both Wr and Wb are small, there are two cases: use less than Wb red candies or use less than Wr blue candies. Thank you, I can hack now. Problem C have been used in a regional contest in China. How to solve Problem B? I found out the path having maximum number of lights, but had problem in incrementing values of edges and distributing the increment among edges in a path. Maybe I complicated it too much. Btw, I solved C using some hacky brute-force constantly checking time limit until 0.9 second passes. How bad am I for doing is that? Actually, it's easier to gain a lot of rating in a combined division round than a div1 only round for some reason. Heh. I also submitted such solution (10589617), and wondered whether it works in the general case. Thank you for the test! Please, take a look at this submission. We can see that an array check with 100 elements(indexed from 0 to 99) is declared. Here "..." means a lot of '*'s, not dots. It doesn't give runtime-error. It causes undefined behaviour and sometimes works correctly. Can someone please explain the solution for problem E? I didn't understand it from the Editorial. I really like the way in which testcases for E were generated. All large tests are we'll give you 50 queires, but most of them will be same. Are you serious, guys? :) Looks like most of O(N * log(N) * Q) solutions can pass after adding memoization. My messy implementation (10587744) wasn't even able to pass pretest 10 during contest, and after adding memoization it runs in 1.6 seconds (10600918). What is more, there are some wrong submissions which passed (as pointed out above). What's more, just 21 tests. Is there any tutorial for this contest? It looks like ZeptoLab has bad luck with repeating problems. As pointed above, C, E and F were already present in some places of the Internet and one year ago E was from Junior Polish Olympiad in Informatics (I watched editorial created by johnasselta during the contest :P) and F was used in Petr Mitrichev contest. I'm not sure I understood. Didn't Petr clearly state that this problem was present on his contest? Will this contest an editorial?I haven't see it. Server time: Apr/26/2019 17:46:04 (e3).